Artech believes in the 3L philosophy in creating homes. The 3Ls stand for Luxury, Lifestyle and Leisure. The idea was propounded by Artech Managing Director, Mr. T. S. Asok, in his initial years in business and today it has become a way of life at Artech. 3L is the thought that drove Artech to be the Pride of Kerala in just two decades. Mr. T. S. Asok started off his career as a town planner after completing B.Tech in Civil Engineering and Post Graduation in Planning. 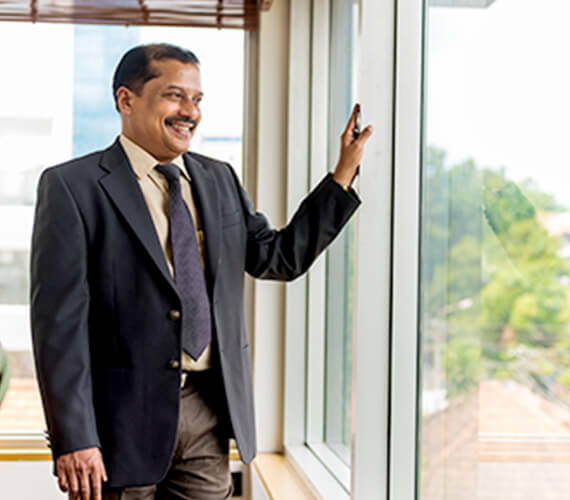 His sound educational background and his wealth of knowledge in planning helped him build one of the landmark realty companies in South India and a brand that is the Pride of Kerala in the industry today. His penchant for innovation in planning, designing and building along with his fast decision-making capability made him a stalwart in the realty industry. He is a pioneer in many ways if you look at the projects he has conceived and implemented as a career businessman. His views on the realty industry and innovative approach to business in the modern world are celebrated in many fast-growing countries of the world. To get a peep into his mind, kindly go through some of his thoughts that have been shared by the media with the public at large. The annual property show conducted by Trivandrum chapter of The Confederation of Real Estate Developer’s Associations of India (CREDAI) offers a variety of choices for quality homes for safer investments. Director T.S Asok opined that property shows like these should strive for more improved and innovative strategy to attract discerning buyers. For instance, providing exciting offers to the prospective buyers can bring so much positive impact on the sales. The Kerala Real Estate (Development and Regulation) Ordinance is expected to provide a uniform regulatory environment and ensure orderly growth of the sector. T.S. Asok, MD Artech Builders welcomes the Ordinance saying that it will be more realistic since it encompasses regional conditions and gives legal backing to every real estate transaction. T.S. Asok is a successful young entrepreneur who bagged the Yentha’s Young Entrepreneur of the week title. Being the MD of Artech Realtors, Trivandrum, he has taken the builder to a formidable position in the highly competitive construction business in Kerala. Contrary to the dream of a perfect world, Asok prefers the reality of the unequal world. After having earned their name with high rise apartments and huge commercial complexes, Asok reveals that Artech Realtors now plans to turn into constructing affordable housing for the lower income group.